Canada doesn’t get much attention these days on the world stage. Our world leader isn’t a racist, bigoted rotting orange in a suit, but nor is he the Prime Minster Centrefold he used to be. Thanks for stealing that attention, Macron. We are kind of quiet about things and stay as neutral as possible on the world stage while still trying to achieve our goals. We don’t like to cause a ruckus. But when we do, you know we’re super sorry about it. So it might surprise you to learn that Canada has trouble brewing. And it comes in the form of a giant inflatable duck. This is a real thing, guys. We have a giant motherducking problem. The oversized novelty bathtub toy is set to make its debut in Toronto on July 1st (Canada Day) as part of the 150th birthday celebrations. It was meant to be a fun, if not slightly ridiculous, tourist attraction funded primarily by the Ontario government. Yet the controversies surrounding this 6-storey tall rubbber duck has grown to be quackers. The actual cost of this giant inflatable tourist attraction seems a bit unclear. The lowest cost I’ve heard for the rent and installation of this duck is $70,000. Conservative Members of Provincial Parliament claim the cost is closer to $200,000. Our government (Liberals) and supporters of the rubber duck feel it’s well worth the cost, as such a ridiculous and fun thing will draw tourists and pay for itself. I mean, who doesn’t want to take a selfie with a giant rubber duck? Conservatives cry that it’s a waste of tax payer money. I mean, it’s a big rubber duck, costing $70,000-$200,000. Imagine all the people we could feed with that! Imagine all the problems we could fix in our country with that kind of money! Conservatives never want to spend money on things like ‘feeding the poor’ (the way they put it), because that’s not how Conservatives spend money. That’s not how budgeting works. This amount of money, whether it’s $70K, $200K, or one million dollars, has been allocated to Canada’s 150th celebrations. So it was going to be spent on something frivolous or stupid anyway. 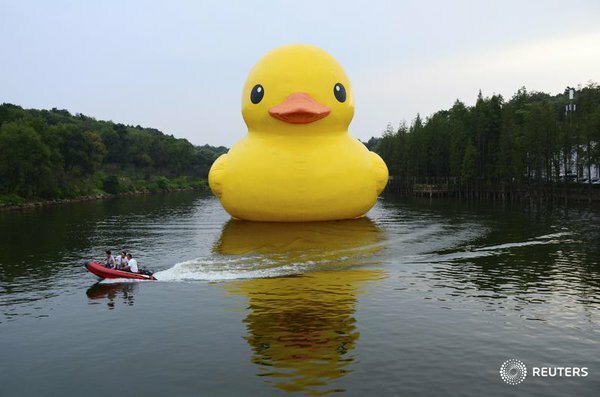 There are rumblings that the rubber duck the 150 Canada celebration organizers have chosen to rent is a knock-off. Our duck is coming from a man in the US, and while he is the owner of this particular giant rubber duck, it is not the first of its kind, nor is it a creation of this gentleman. A Dutch design company is claiming this American duck is simply a rip off of their concept and design, and that the Ontario government should have instead contacted them to ensure the 150th Canadian celebrations were done right. And with the original giant rubber duck, not this so-called counterfeit. The fight over who has the true copyrights to this giant duck have been going on for a few years now. The Dutch artist, Florentijn Hofman, had been contracted by events producer Craig Samborski to create this duck for an event at the Los Angeles waterfront, but when he failed to deliver the duck drawings as specified, Samborski and his partner Ryan Whaley had the giant duck built by an American company. So, that would be a no. The third controversy plaguing the giant duck: A lack of patriotism. What comes to mind when you think about Canada? Hockey? Snow? Canadian geese, maybe? Mountie, loons (the bird, thank you), a maple leaf? Those are all very relevant iconic Canadian things, albeit slightly stereotypical, HOW DARE YOU. But you’ll notice ‘giant rubber duck’ wasn’t on that list. Anti-duckers are upset that we’re investing so much money is something that doesn’t really represent Canada. See? Canadians can be patriotic. We’re just quieter about it. Why couldn’t we get a giant beave– okay, bad example. Why couldn’t we just get a giant inflatable Tim Horton’s coffee cup? Or moose? Or hockey puck? This actually ties back into the first controversy about the cost of the duck. If conservatives and other similar-minded people hate that we’re spending so much on an inflatable duck? They’d loose their minds over the cost of contracting someone to create and install a brand-new piece. The last, and more serious controversy surrounding the giant rubber duck is the fact that not everyone is thrilled to be celebrating 150 years of Canada, period. See, like most countries that were ‘settled’ by Europeans, we also have a deep, dark history of stealing land that wasn’t ours and treating the people that were already here in Canada like garbage. We’re actually still pretty garbage at taking care of our Indigenous population. So you can understand why not everyone is keen to celebrate the 150th anniversary of this settlement. This is a controversy that of course extends beyond a stupid rubber duck, but whenever we start to talk about celebrating the last 150 years of Canada, it’s an issue that comes up. Understandably. Because it’s 2017 and 150 years later people still don’t get the point when it comes to our Indigenous peoples. So there it is. Canada has scandals and controversies, too, guys. We’re just super Canadian about it. Sorry.